Rugged off-road looks are part of Subaru’s ‘Bolder’ styling philosophy. Concept vehicles are often used by motor manufacturers as an outlet for their design teams to express their pent up creative energies as well as to gauge the public’s interest in future design directions they may be taking. The Subaru Viziv Adrenaline Concept is a bit of both. According to the press release, this latest vehicle is an evolution of the ‘Dynamic x Solid’ design philosophy that was created in 2014. This developed into the mid-term management vision called ‘Step’ in 2018 which has now become the ‘Bolder’ design philosophy for 2019. No, we don’t know what any of that means either, perhaps Subaru’s marketing team can clear things up: "Through the new 'Bolder' design philosophy, Subaru aims to broaden the brand's outlook, define the characteristics of Subaru vehicles more prominently and create more enjoyment for all passengers.” Ok, that didn’t help much but clearly, Subaru is letting both its design and editorial team free reign in their creative expression and that is a good thing. Somewhat less cryptically, Subaru did say that the Viziv Adrenaline Concept supported active lifestyles with off-road driving capability, although for now details of what might power this off-roader have not been revealed. The chunky off-road tires and impressively high ride-height do hint at serious abilities off the beaten track. It does have the currently fashionable camera-based side mirrors and what look to be rear suicide doors so short that the car seems almost coupe-like in profile. Whether the Viziv Adrenaline Concept ever makes it into production in the shape you see here is unlikely, but expect to see numerous styling elements making their way into the next generation of Subaru crossovers and SUVs. 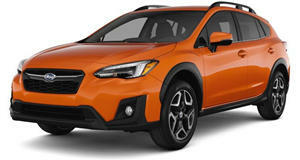 It certainly has a lot in common with the current Crosstrek crossover and could make a great starting point for that model’s replacement in a few years. After all, the name Viziv is derived from the phrase "Vision for Innovation” and that is definitely what the motor industry needs to stay relevant.